Pecan trees, fruit trees and all other fruit and nut plants can be grown organically with great success. And that’s good because production will increase, taste will be better and you’ll be healthier. 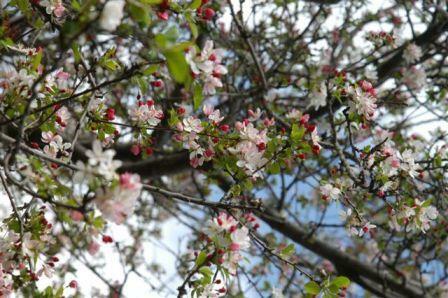 Fruit trees and ornamental flowering trees will benefit from the organic program. Even more important than with ornamental trees, fruit and nut trees should never be planted low in the ground. Trees, even bare-rooted ones) should be set high so that the flare is dramatically above the ground. Fruit trees are notorious for being planted too deeply and that is the cause of stress that relates directly to insect pests and diseases problems. As a guide, the swelling or “dogleg” at the bases of trees is the graft union and is normally 8-10 above the start of the roots where the flare is located. The first step is to dig the hole the correct size and shape. Before even starting to dig the hole, the actual height of the root ball needs to be established. Most trees, in containers and balled and burlapped, have excess soil on the top of the true root ball. The excess soil needs to be removed. Now you can measure the width and the depth of the actual root ball. Dig a very wide, rough-sided hole, 2 to 3 times wider than the tree ball, especially at the soil surface. Square-shaped holes also work. The point is to have well-aerated soil around the new root ball and to prevent the roots from circling in the hole. Digging a small, smooth-sided hole is the worst thing you can do. The width of the bottom of the hole isn't as important as the top of the hole. The depth of the hole should be slightly less than the height of the ball. Measure don't guess. The top of the root ball should be sticking out of the ground about 2” after planting. The bottom of the root ball should be sitting on firm undisturbed soil. When you over-dig and have to put backfill under the ball, the tree can settle. this is a common cause of root flares being too deep in the ground. If fill under the ball is unavoidable, tamp the soil to compact it before planting. If you set the ball too low in the first place, that can be even worse. It's best to set trees and other woody plants 2-3” higher than ground grade (even higher with larger root balls) to allow for settling and/or being planted too low. Apply organic fertilizer @ 20 lbs. per 1,000 sq. ft. Whole ground cornmeal at 20 lbs. per 1,000 sq. ft.
Dry molasses @ 20 lbs. per 1,000 sq. ft.
Lava sand at 80 lbs. per 1,000 sq. ft.
Organic fertilizer @ 10 lbs. per 1,000 sq. ft.
Lava sand @ 40 lbs. per 1,000 sq. ft.
Use soft rock phosphate or other rock mineral such as Azomite at 40 lbs. per 1000 sq. ft.
sul-po-mag @ 20 lbs. per 1,000 sq. ft. Apply Azomite at 40 lbs. per 1000 sq. ft.
1st spraying: Spray Garrett Juice and cornmeal tea or garlic tea at pink bud, before flowers have opened. Also drench it throughout the root system at 1 gal. per 1000 sq ft.
2nd spraying: Use the same mix after flowers have fallen. 4th spraying: Last week in August through mid September. Use additional sprayings as time and budget allow. Note: If other quality organic sprays are used, make sure apple cider vinegar is included in the mix at one ounce per gallon. Apply dry molasses or sorghum at 20 lbs. per 1000 square feet. Spray Garrett Juice and cornmeal tea or garlic tea every 30 days. 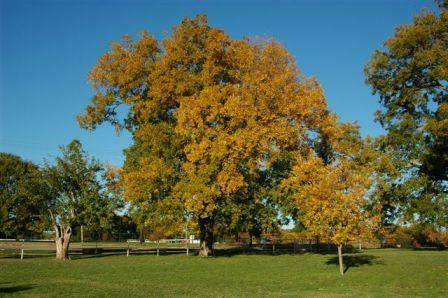 Very little pruning is needed or recommended on pecan and walnut trees, also for pears, pomegranates, jujubes and figs. Peaches and apples should have about 40% of the crown removed in late winter if possible. Limbs left after pruning at about 45 degree angle will tend to be the most productive and it also make fruit harvest easier. Prune away about 40% of limbs late winter and leave limbs at about 40 degree angles for best production. Maintain cover crops and/or natural mulch under the trees year round. Never cultivate the soil under pecan and fruit trees to avoid damage to feeder roots. No food plants should never have bare soil in the root zone, but should always be covered with native shredded mulches and/or native grasses and legumes. Trees should be planted high with natural organic techniques. Trunk flares should be easily visible. Trichogramma wasps: Weekly releases of 10,000 - 20,000 eggs per acre or residential lot starting at bud break. Repeat for 3 weeks if the budget allows but one application is enough for most sites. Green lacewings: Release at 4,000 eggs per acre or residential lot weekly for one month. One application, again, is enough is most cases where buggets are limited. Ladybugs: Optional and as needed - release 1,500 - 2,000 adult beetles per 1,000 square feet when shiny honeydew is on foliage.